Bob Log III remains a fascinating cult figure; an enigmatic icon who appears on stage in a boiler suit and flight helmet with a hairy motherfuckin’ hand (rumored to be a monkey paw). Essentially, his music draws heavily on the combined influence of garage rock, bluegrass and pure delta blues. Bob Log III likes to keep things simple. His signature style is built around a one man band approach that he began employing out of necessity almost a decade ago. His guitar growls like a rabies-infested mutt, straight from the backyard of an Alabama whorehouse. Muffled vocals are screamed out from behind the imposing flight helmet, along with all manner of weird and wonderful tape distortions and various other bits and bobs. 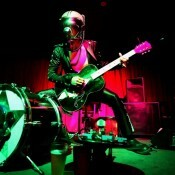 Bob Log III’s live shows are wild affairs. Bob likes to ride rubber dinghies across the heads of his audience and also likes balancing three women on his lap (on a good night) while the groan of his six stringed demon viciously dominates the aural realm.